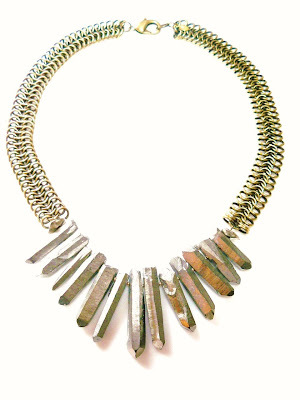 New Designer: Heather Kahn Jewelry in Los Angeles. I like discovering new designers and new collections. This is a funky mod new line of jewelry from Heather Kahn, carried at Agency showroom in Los Angeles that I picked up for a client recently. The necklaces have PVC shaped crystals on brass chainmaille. Kind of cool looking. These retail for about $200 on up. The line is carried at Agency Showroom in DTLA in the Cooper Building. What do you think? Weird or Wonderful?